Judy A Goddard, Artisan: Whimsey Wednesday: Holy Cow! The height of my artistic life! I made a cow! 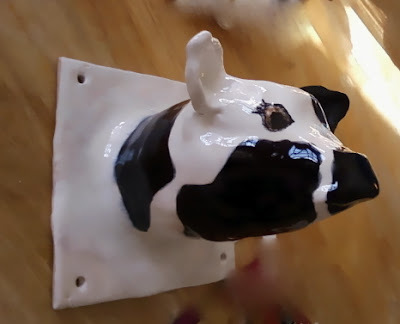 I replied to an Etsy Alchemy request for a kitchen towel holder that looks like a holstein cow. So, after much deliberation, planning and execution, here she is. My friend David named her "Bossy"
Clay is such a cool medium! I just love working in 3D. Maybe that's because I don't have a whole lot of depth perception. It's such a challenge. I love it! this is fantastic - great addition to the whimsy! This is great! So shiny too! Bet you had a lot of fun making it too! It also gives me ideas for other posts myself!